Bob Hope, KBE (May 29, 1903 – July 27, 2003), born Leslie Townes Hope, was an English-born American entertainer whose prolific career spanned nearly a century from 1915 until his death in 2003, and included success in all show business media from vaudeville, and Broadway, to radio, television, and movies. Hope is particularly remembered for his annual Christmas shows, performed live and later televised, to honor the American Military who were away from families while stationed overseas. He did these entertainment tours from World War II up until the Persian Gulf War with the USO. His comedic style was rapid fire jokes laced with sarcasm and self-deprecating comments. Though a favorite target for his particular brand of humor were United States Presidents, his passion lay in serving his adopted country. He once said, "I've got a real crush on America. Nobody ever had a girl like her. Nobody ever gave me as much affection, as much honor, or as much real estate. In a way, in this most democratic of democracies, I sometimes feel like a king." Hope, who earned the moniker "The King of Comedy," was awarded the Presidential Medal of Freedom by President Lyndon B. Johnson for his humanitarian efforts. He is also recognized as The Most Honored Entertainer by The Guinness Book of World Records. Hope was born in Eltham, London, England, the fifth of seven sons. His English father, William Henry Hope, was a stonemason and his Welsh mother, Avis Townes, was an operetta singer who also helped subsidize the families' income by leasing out rooms and house cleaning. The family moved to Cleveland, Ohio in 1908. Hope became a United States citizen in 1920 at the age of seventeen after his father became a naturalized citizen. The family struggled financially so, at the age of twelve, Hope began to work at a wide variety of odd jobs. He entered many dancing and amateur talent contests. In 1915 he won a prize at Luna Park, Cleveland, for his impersonation of Charlie Chaplin. He boxed briefly, though unsuccessfully, under the name 'Packy East'. Of that attempt he once quipped, "I was on more canvases than Picasso." Hope dropped out of school at the age of sixteen. In 1967, he recalled of his past, "We'd have been called juvenile delinquents only our neighborhood couldn't afford a sociologist." In the late 1920s and early 1930s Hope performed on the vaudeville "Gus Sun circuit" which traveled to small towns and rural areas putting on miniature shows called "tabs." In a biography, Hope was quoted as saying of his time in vaudeville, "…in the days when rooming houses carried signs saying, NO DOGS OR ACTORS ALLOWED, sinced I wasn't considered either one, I usually got a room." Having to perform before a live audience and constantly having to come up with fresh jokes allowed Hope to hone his sense of comedic timing—a trait which stayed with him throughout his career. From 1926-1927, Hope toured with George Byrne under his new name, 'Lester' Hope, which he felt was more masculine. Perfecting his technique with Louise Troxell as his sidekick, he would develop an alter ego in many of his routines; not only was he the performer, but he could step outside of himself to join the audience in mocking himself. Once he created this bond with the audience he could rise above poor material and still get laughs. The highlight of his vaudeville career was playing the Imperial Palace in a revue called "The Antics of 1931." After six years vaudeville's popularity was on the wane as large movie theaters with "talking" pictures came on the scene. It was time to seek out a new challenge—the Broadway stage. The next big step in Hope's career was his appearance in the Broadway musical Roberta, featuring songs by Jerome Kern. As Hope's trademark style was developing so was his uncanny ability to know what would make an audience laugh; thus even though reviews were lukewarm, Hope's career was firmly launched. His growing reputation for throwing slightly off-color one-liners such as, "Long dresses don't bother me; I have a good memory," kept audiences laughing. Hope's next important play was Ziegfield Follies starring Fanny Brice and Eve Arden. Hope performed well as a straight man surrounded by beautiful women. Rejected again and again by a bevy of beautiful women would become a standard theme in his humor—and it provided endless fodder (at his expense) for many of his routines over the years. The success of this play led to a lead role in Red, Hot and Blue, whose title song's lyrics were written by Cole Porter, and which starred Ethel Merman and Jimmy Durante. Hope's career in radio began at the same time that radio broadcasting was becoming a household item in the early 1920s. Although, it was an adjustment for vaudevillians like Hope to "perform" without a live audience, it was through this medium that Hope developed his gift for monologue. Sponsors named radio programs after their products and one of Hope's earliest and longest lasting associations was with The Pepsodent Radio Show starring Bob Hope. In 1940 the show surpassed Jack Benny's Jello Show to become number one in the nation. Hope's irreverence towards political figures, himself, and even his sponsors set him apart from other comedians and was daring for that time. Hope's career in radio spanned sixty-four years. The Pepsodent show ran through 1953 and scored the highest ratings throughout World War II. Eventually, the popularity of radio comedy decreased as radio became a medium primarily for music. Like radio and theater, Hope's rise in film did not come immediately. His rise to success was through same hard work and determination that had always worked for him. His debut in a full length feature film was in The Big Broadcast of 1938. Although the movie did not receive particularly rave reviews the featured song, Thanks for the Memory did, and Hope made the song his signature piece. The sentimental and fluid nature of its music allowed Hope's writers to later invent endless variations of the song to fit specific circumstances, such as bidding farewell to troops while on tour. The first "Road" movie—a series of seven classics starring Hope, Bing Crosby and Dorothy Lamour—was The Road to Singapore. In the movie, a friendly feud is established between Crosby and Hope that would be a feature of their comedy throughout their careers. The two engage in a fierce rivalry, madcap adventures, and of course, Crosby gets the girl. Lamour is the actress most associated with Hope's film career, along with Paulette Goddard, Lucille Ball, Jane Russell, and Hedy Lamarr. Hope starred in a long string of Paramount Pictures like Fancy Pants, Monsieur Beaucaire, and Caught in the Draft. From 1957 to 1972 he made nearly twenty films and all total he made fifty three playing roles from nitwit spies (My Favorite Spy 1951 with Hedy Lamarr) to swashbuckling pirates (The Princess and the Pirate Virginia Mayo 1945.) Although not particularly noted for his physical comedy, Hope often wore outlandish attire which included dressing in drag (The Lemon Drop Kid 1951). Additionally, his large bulging eyes communicated humor just as his ski jump nose often received the brunt of his jokes. Bob Hope never won any Academy Awards for his performances, but the Academy of Motion Picture Arts and Sciences honored him with several special awards and he served as Master of Ceremonies for the Academy Awards ceremony many times. While hosting one of these presentations he famously quipped that the Oscar awards were, "known at my house, as Passover." As a spokesperson for Frigidaire and then Chrysler, Hope's association with NBC, lasted for twenty four years. The Bob Hope Chrysler Theatre aired on NBC from 1963-1967. It was one of the last major anthology series on network TV. Both dramatic and comedy shows were presented, featuring many of Hollywood's top names. Every month or so, Hope would host a variety special in the show's time slot. On those occasions, the show was entitled "Chrysler presents a Bob Hope Special." Speaking of his work on TV hope said, "I honestly think that the secret of TV is being relaxed, casual, and easy. I've slowed down for television, especially with my monologue." In 1948, Hope began a Christmas tradition of touring overseas military bases, eventually filming these shows for television starting in 1954. The 90-minute Bob Hope Christmas Specials were broadcast every holiday season until 1972. Reportedly his Christmas Specials of 1970 and 1971 scored the highest Nielsen ratings ever for specials. The shows were popular favorites and he adapted his monologue to fit the situation of the G.I.s. In 1958, Hope traveled to Moscow, Russia after an endless round of bureaucratic negotiating. His Easter show there became a major news event even if some of his humor was looked askance at by communist officials. "Surprisingly enough, I'm not having any trouble with the language. Nobody talks to me," Hope quipped while in Russia. His final television special was in 1996 with Tony Danza who helped Hope present a retrospective about the Presidents of the United States. Hope performed his first United Service Organizations (USO) show on May 6, 1941, at March Field, California. He continued to travel and entertain troops for the rest of World War II and later during the Korean War, the Vietnam War and the 1990–1991 Persian Gulf War. When overseas he almost always performed in Army fatigues as a show of support for his audience. He downplayed the precarious situation he and his troupe often found themselves in, such as nearby gunfire, by joking, "I wonder which of my films they saw?" Hope's USO career lasted half a century, during which he headlined approximately sixty tours. For his service to his country through the USO, Hope was awarded the prestigious Sylvanus Thayer Award by the United States Military Academy at West Point in 1968. A 1997 an act of the United States Congress signed by President William Jefferson Clinton named Hope an "Honorary Veteran." Hope had a widely reported passion for sports. He boxed professionally during his youth, was a pool hustler, enjoyed watching American football and was at times a part owner of the Cleveland Indians and Los Angeles Rams. Hope was also famous for his interest in golf. He played in a few Professional Golfers Association of America tour events and the Bob Hope Chrysler Classic is named for him. Hope played golf with nearly every President of the United States from Dwight D. Eisenhower to George W. Bush and often used a golf club as an on-stage prop. Hope married Dolores DeFina, February 19, 1934. A devout Roman Catholic, the Bronx-born nightclub singer of Irish and Italian ancestry was known professionally as Dolores Reade. Hope came to "The Vogue," a Manhattan nightclub where Reade was performing accompanied by his friend and co-star in Roberta George Murphy. While she was a successful performer in her own right, with a "low voice, and dignified manner," she soon took on the role of loyal wife. They remained together until Hope's death sixty-nine years later, one of the longest-lasting high profile marriages in Hollywood's history. The Hopes adopted four children, all from the same orphanage in Evanston, Illinois, who all continued on to have successful careers in and out of the entertainment industry. In 1997, Hope was awarded the Ronald Reagan Freedom Award by Nancy Reagan at the Beverly Hilton Hotel, in Beverly Hills, California. The award is given to "those who have made monumental and lasting contributions to the cause of freedom worldwide." Hope celebrated his 100th birthday on May 29, 2003, joining a small group of notable centenarians in the field of entertainment (including Irving Berlin, Hal Roach, Senor Wences, and George Burns.) 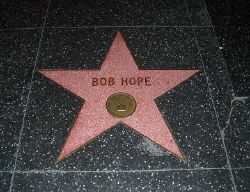 To mark this event, the intersection of Hollywood and Vine in Los Angeles, California was named Bob Hope Square and his centennial was declared Bob Hope Day in thirty five U.S. states. Hope spent the day privately in his Toluca Lake, Los Angeles, California (north of Hollywood) home where he had lived since 1937. Even at 100 years of age and with failing health, Hope is said to have maintained his self-deprecating sense of humor, quipping "I'm so old, they've canceled my blood type." According to one of Hope's daughters, when asked on his deathbed where he wanted to be buried, he told his wife, "Surprise me." He died of pneumonia two months later at 9:28 p.m., July 27, 2003, at his home in Toluca Lake. Bob Hope is interred in the Bob Hope Memorial Gardens at Mission San Fernando Rey de España in Los Angeles. A reporter asked him, "What's it like to be Bob Hope? "I wouldn't have it any other way." My birthplace is now marked by a large statue of a chicken. It stands at the spot where my father got his first look at my nose and said, "There's been some mistake, they've taken the baby and left the stork." In a 2005 poll to find The Comedian's Comedian, he was voted among the top 50 comedy acts ever by fellow comedians and comedy insiders. Honorary Order of the Knight Commander of the British Empire (KBE) In recognition of his contributions to film, to song, and to the entertainment of troops in the past. (1998). He had previously been made an Honorary Commander of the British Empire (CBE) in 1976. Two years to the day Hope died, family members and friends attended a dedication of the Bob Hope Memorial Garden at the San Fernando Mission in Mission Hills, California, created as an inspirational final resting place. Adjacent to the mission chapel and overlooking the cemetery, the English-style flower garden decorated with religious statues and meditation benches opened to the public July 29, 2005. Dolores Hope received a 99th birthday present from President George W. Bush when he signed a measure into law in 2008 re-designating the Ellis Island Library, on the third floor of the Ellis Island Immigration Museum in New York Harbor, as the Bob Hope Memorial Library. In 1990, Ellis Island was turned into a museum to commemorate the 16 million immigrants who passed through Ellis Island from 1892-1954 to pursue the American Dream. 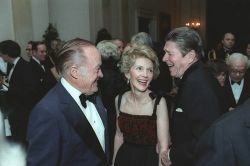 When the Ellis Island Restoration Commission suggested naming the third floor library of the museum in honor of Bob Hope in 1990; he remarked that it would be "One of the single most important highpoints in my career." Hope entered the United States through Ellis Island with his family in 1907. At the official opening of the Bob Hope Memorial Library the U.S. postal service was present to unveil a sneak preview of the Bob Hope First-Class commemorative stamp to be issued in the Spring of 2009. The Basilica of the National Shrine of the Immaculate Conception in Washington, D.C. has a wing dedicated to a miracle in Pontmain, France which was funded by Dolores and Bob Hope in memory of his mother. 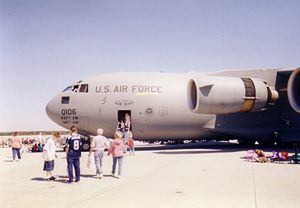 The Spirit of Bob Hope is a USAF C-17 Globemaster III that was named after the performer. PGA Bob Hope Chrysler Classic, which was an existing tournament (The Desert Classic) was renamed in 1966 in recognition of the comedian's lifelong passion for the game. Bob Hope: 50 Years of Hope, an exhibition of Hope's service to the United States military at the National Museum of the United States Air Force near Dayton, Ohio. The Bob Hope Airport was named after him when he had joked with his family that he wanted an airport named for him after hearing in 1979 that Orange County, California officials had renamed their airport after John Wayne. On November 3, 2003 the Burbank-Glendale-Pasadena Airport Authority voted unanimously to rename the facility and on November 18, 2003, the Glendale, California, and Burbank, California city councils voted unanimously to approve it. Pasadena, California followed on December 10. A rededication ceremony took place on December 17, the 100th anniversary of the Wright brothers' first powered flight. The Hope Memorial Bridge in Cleveland, Ohio, originally the Lorain-Carnegie Bridge, was closed in 1980-83 for the replacement of the concrete roadway deck. Upon reopening, it was renamed the Hope Memorial Bridge, in honor of the family of entertainer Bob Hope, who were stonemasons from Cleveland. In 1997, Dolores Hope christened the USNS Bob Hope (AKR 300) in New Orleans. Not to be outdone, one month later the U.S. Air Force dedicated a new C-17 in Hope's name. ↑ 1.0 1.1 Library of Congress, Bob Hope and American Variety. Retrieved March 20, 2018. ↑ 2.0 2.1 2.2 2.3 2.4 2.5 Joe Morella, Edward Z. Epstein, and Eleanor Clark, The Amazing Careers of Bob Hope (Arlington House, 1973, ISBN 0870001914). ↑ 3.0 3.1 Bob Hope with Melville Shavelson, Don't Shoot, It's Only Me (Putnam's Sons, 1990, ISBN 0399135189). ↑ TV Party, Bob hope on TV. Retrieved March 20, 2018. ↑ John Steinbeck, Once There Was A War (Penguin Classics, 2007). 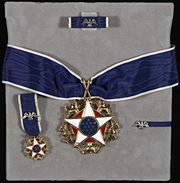 ↑ The Ronald Reagan Freedom Award. Retrieved March 20, 2018. ↑ BBC, "Comedian Bob Hope dies." Retrieved March 20, 2018. ↑ John Dart, Pope Honors Rupert Murdoch, Roy Disney, Bob Hope Los Angeles Times, January 3, 1998. Retrieved March 20, 2018. ↑ Mission San Fernando Bob Hope Memorial Retrieved March 20, 2018. ↑ Basilica of the National Shrine of the Immaculate Conception, Our Lady of Hope. Retrieved March 20, 2018. ↑ National Museum of the NASF, Bob Hope: 50 Years of Hope Retrieved March 20, 2018. Faith, William Robert. Bob Hope: A Life in Comedy. Putnam's Sons, 1982. ISBN 0399126279. Grudens, Richard. The Spirit of Bob Hope: One Hundred Years, One Million Laughs. Stony Brook, NY: Celebrity Profiles Pub., 2002. ISBN 1575792273. Hope, Bob with Melville Shavelson. Don't Shoot, It's Only Me. Putnam's Sons, 1990. ISBN 0399135189. Hope, Bob, and Linda Hope. Bob Hope: My Life in Jokes. New York, NY: Hyperion, 2003. ISBN 1401300952. McCaffrey, Donald W. The Road to Comedy: The Films of Bob Hope. Westport, CN: Praeger, 2005. ISBN 0275982572. Morella, Joe and Edward Z. Epstein and Eleanor Clark. The Amazing Careers of Bob Hope. Arlington House, 1973. ISBN 0870001914. Dob and Dolores Hope Foundation Bobhope.com. Tribute to Bob Hope Maritimequest.com. This page was last modified on 27 March 2018, at 14:21.